"These extraordinary granite sculptures, with their carved figures depicting scenes from the life of Christ, resonate with the Celtic spirit and the Breton’s natural predisposition to melancholy. Wayside crosses, shrines and calvaries are found right across Europe. But they are especially visible elements of the Brittany landscape, most particularly in the département of Finistère. There are simple granite crosses through this north-west extremity of France. Some stand proud by small country roads and tracks, others are half-hidden by vegetation in stone walls. Some stand on roughhewn altars, often adorned with a plant or small vase of fresh flowers. There are also traditional representations of Christ on the Cross in most churchyards. But in addition, the region boasts a number of monumental calvaries on a much grander scale." We visited four calvaries. "Relating the story of Jesus’ life in gritty stone figures, they focus mainly on the Easter story, or Christ’s Passion. Occasionally, a local saint puts in a surprise appearance too, or a local sinner, like irreverent Katell Gollet. Most of the calvaries date from the 15th to the 17th centuries, their carvings weathered by the elements." Here we are in Pleyben, a village in Bretagne, where we saw a monumental calvary, dating from 1555 and standing close to the Saint- Germain Church. If you are versed in the Bible, you might recognise some scenes. Philine: Yes, this expression of naive, deep piety is very typical for the Bretagne. Many thanks, Sherri! Pleyben est magnifique, il y a aussi un superbe calvaire à Plougastel-Daoulas. Philine: Merci bien, Martine! Nous avons vue seulement quatre calvaire - très impressionnants. They are all very impressive, Philine. These are something very special Philine. Philine: Typical for Brittany. Many thanks, Bill! Philine: Thank you very much for your kind comment, Chris - My thoughts are with Brtitain in these days. What an incredible sight. I see that in the centre image what looks like a pigeon is being worshipped; I do note that they are not welcome in the church, though! Philine: Oh, Alan, the pigeon you see is the cockerel that reminded St. Peter to have lied. I am sure you know this story. Many thanks! Philine: Brittany is not far from England. Many thanks, Lisl! 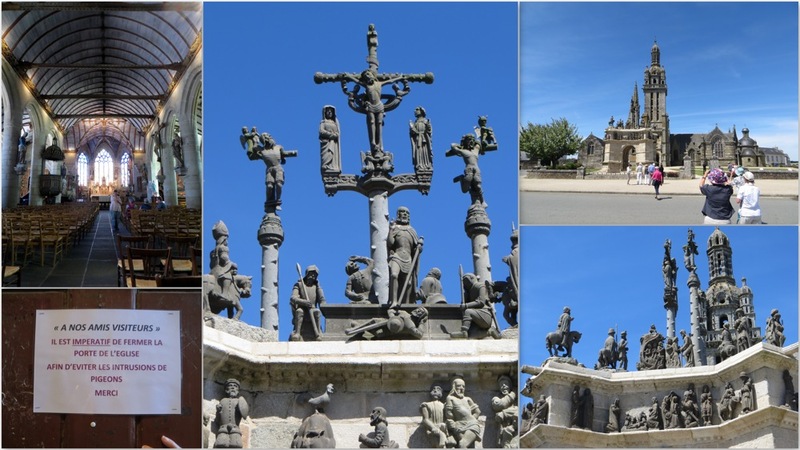 Fantastic sculptures and they do remind me of the Camino route. I am interested that you say the Britons are a melancholic race. Philine: Not the Britons, but the Bretons. I think the Germans tend rather to melancholy than the Britons. I understand that the calvaires do remind you of the Camino route. The Bretons are a Catholic folk. Many thanks, Chad! These are a very impressive set of Calvaries to be able to see. To have this detail over that many years is astounding. Thank you for providing such a detailed narrative to accompany these amazing sculptures, Philine. It is always informative to understand the history behind religious scenes like this. Philine: Thank you kindly, Beverly! Very impressive, there must have worked good artists for these calvaries. I wonder what they would say, if they could see them again after all those centuries.